To get the job done, your field workers need a rugged, reliable device to provide remote access to real-time data. They also need a device that is easy to use. Introducing the Symbol TC55, the pocket-sized, all-touch mobile computer that has it all. The TC55 Touch Computer marries rich enterprise features with smartphone usability and form factor. For example, workers can capture practically any type of data "" from barcodes and signatures to photos, videos and NFC "" improving on the job efficiency and customer service. The screen is optimized for Enterprise viewing, helping ensure the battery lasts a full shift. And with a drop, tumble and environmental sealing specification you can count on, it has the durability required to serve your field workers for years. No Scanner, 8MP Camera, Android Jellybean, Standard Capacity Battery, Wifi, 1GB/8GB. Includes USB cable and 2 year service contract. Charging Cradles and Power Supply Sold Separately. Single charging cup (Part# CBL-TC55-CHG1-01) needs power supply (Part# PWRS-124306-01R). 5- slot- CRDUNIV-55-5000R REQUIRES POWER (Part# PWRS-14000-148C) AND AC LINE CORD (Part# 23844-00-00R). No Scanner, 8MP Camera, 4G LTE Verizon Data Only, WiFi (802.11 a/b/g/n), NFC, GMS, Android Jellybean, 1GB RAM/8GB ROM, Standard battery. Includes USB cable and 2 year service contract. Charging Cradles and Power Supply Sold Separately. Single charging cup (Part# CBL-TC55-CHG1-01) needs power supply (Part# PWRS-124306-01R). 5- slot- CRDUNIV-55-5000R REQUIRES POWER (Part# PWRS-14000-148C) AND AC LINE CORD (Part# 23844-00-00R). No Scanner, 8MP Camera, 3G Verizon Voice and Data, Android Jellybean, Expanded Battery, Wifi, 1GB/8GB. Includes USB Cable and 2 year service contract. Charging Cradles and Power Supply Sold Separately. Single charging cup (Part# CBL-TC55-CHG1-01) needs power supply (Part# PWRS-124306-01R). 5- slot- CRDUNIV-55-5000R REQUIRES POWER (Part# PWRS-14000-148C) AND AC LINE CORD (Part# 23844-00-00R). 1D Linear Imager, 8MP Camera, Android Jellybean, Standard Capacity Battery, Wifi, 1GB/8GB. Includes USB cable and 2 year service contract. Charging Cradles and Power Supply Sold Separately. Single charging cup (Part# CBL-TC55-CHG1-01) needs power supply (Part# PWRS-124306-01R). 5- slot- CRDUNIV-55-5000R REQUIRES POWER (Part# PWRS-14000-148C) AND AC LINE CORD (Part# 23844-00-00R). 4G Non-GMS for Verizon, Data Only, 1D Scanner, Standard Battery, Android Jelly Bean Charging Cradles and Power Supply Sold Separately. Single charging cup (Part# CBL-TC55-CHG1-01) needs power supply (Part# PWRS-124306-01R). 5- slot- CRDUNIV-55-5000R REQUIRES POWER (Part# PWRS-14000-148C) AND AC LINE CORD (Part# 23844-00-00R). Wi-Fi (802.11a/b/g/n), 1D Linear Imager, 8MP Camera, Android Jellybean, Expanded Capacity Battery, 1GB/8GB. Includes USB cable and 2 year service contract. Charging Cradles and Power Supply Sold Separately. Single charging cup (Part# CBL-TC55-CHG1-01) needs power supply (Part# PWRS-124306-01R). 5- slot- CRDUNIV-55-5000R REQUIRES POWER (Part# PWRS-14000-148C) AND AC LINE CORD (Part# 23844-00-00R). Wi-Fi (802.11a/b/g/n), 1D Linear Imager Scanner, 4G LTE Verizon (Data Only), No GMS, 8MP Camera, Android Jellybean, 1GB RAM/8GB Flash. Includes USB cable and 2 year service contract. Charging Cradles and Power Supply Sold Separately. Single charging cup (Part# CBL-TC55-CHG1-01) needs power supply (Part# PWRS-124306-01R). 5- slot- CRDUNIV-55-5000R REQUIRES POWER (Part# PWRS-14000-148C) AND AC LINE CORD (Part# 23844-00-00R). 1D Linear Imager, 8MP Camera, 3G Voice and Data, Android Jellybean, Standard Capacity Battery, Wifi, 1GB/8GB. Includes USB cable and 2 year service contract. Charging Cradles and Power Supply Sold Separately. Single charging cup (Part# CBL-TC55-CHG1-01) needs power supply (Part# PWRS-124306-01R). 5- slot- CRDUNIV-55-5000R REQUIRES POWER (Part# PWRS-14000-148C) AND AC LINE CORD (Part# 23844-00-00R). 1D Linear Imager, 8MP Camera, 4G LTE Verizon Data Only, WiFi (802.11 a/b/g/n), NFC, GMS, Android Jellybean, 1GB RAM/8GB ROM, Standard Battery. Includes USB cable and 2 year service conract. Charging Cradles and Power Supply Sold Separately. Single charging cup (Part# CBL-TC55-CHG1-01) needs power supply (Part# PWRS-124306-01R). 5- slot- CRDUNIV-55-5000R REQUIRES POWER (Part# PWRS-14000-148C) AND AC LINE CORD (Part# 23844-00-00R). 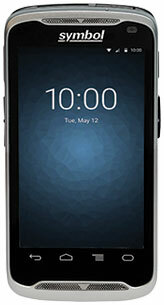 1D Linear Imager, 8MP Camera, 3G Verizon Voice and Data, Android Jellybean, Expanded Capacity Battery, Wi-Fi, 1GB/8GB. Includes USB cable and 2 year service contract. Requires power supply (Part# PWRS-124306-01R). 1D Linear Imager, 8MP Camera, 4G LTE Verizon Data Only, Bluetooth/WiFi (802.11 a/b/g/n), NFC GMS, Android Jellybean, 1GB RAM/8GB ROM, Extended capacity battery. Includes USB cable and 2 year service contract. Charging Cradles and Power Supply Sold Separately. Single charging cup (Part# CBL-TC55-CHG1-01) needs power supply (Part# PWRS-124306-01R). 5- slot- CRDUNIV-55-5000R REQUIRES POWER (Part# PWRS-14000-148C) AND AC LINE CORD (Part# 23844-00-00R). No Scanner, 8MP Camera, 3G Verizon Voice and Data, Android Jellybean, Standard Battery, Wi-Fi, 1GB/8GB. Includes USB Cable and 2 year service contract. Requires power supply (Part# PWRS-124306-01R).